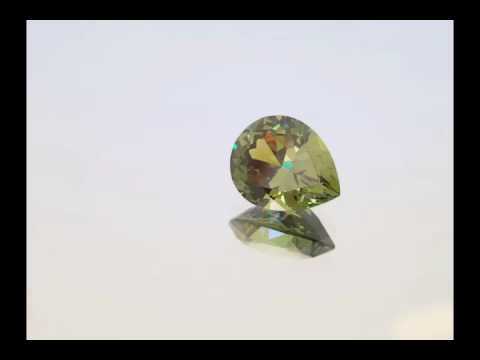 Facets Australia, a 2nd generation coloured stone wholesaling business, specialises in the source and supply of fine, individual gemstones to the jewellery industry. With an emphasis on colour and cut, each stone is individually sourced, selected and, if required, recut to exacting standards. To provide quality coloured gemstones and, when requested, source specialty products for clients with specific requirements. In addition, with over 30 years experience in the gemstone industry, we offer valuable insight in to the care of our product, particularly with regard to do and don’ts when manufacturing, repairing and cleaning jewellery. This channel is dedicated to showcase the gemstones we source globally and the jewellery we manufacture from them. 3.28ct pear shape Demantoid Garnet from the"Green Dragon " mine in central Namibia.